Mar 21, 2019 Posted by AAfterwit on Mar 21, 2019 | Comments Off on Sunk By A Toilet? This is the story of the U-1206, a World War II U-boat (submarine) that was lost due to toilet. Imagine having to explain that your boat was taken out of action and scuttled because of a toilet. Of course, it could be said that the design was a “crappy” one but we digress. As a teacher in an all male public high school, Mr. Hunter recognized two things – most testosterone driven males were not really interested in ancient history and secondly, testosterone driven males at that age like humor that borders on the crude side. 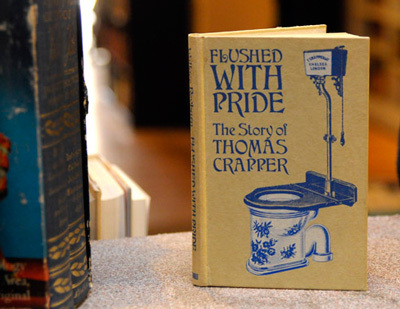 Thomas Crapper is generally credited with the invention of the modern flush toilet and you can see how his name influenced the language of “taking a crap” even today. We were one of the people he inspired who went to the school library and borrowed the book. Somehow the development of the modern flush toilet intrigued us because even though we liked history (ancient and US) we had never read a tome on the toilet. We felt the need to fill that gap in our education and knowledge. Looking back, we realize that Mr. Hunter’s primary objective was not necessarily to have people look or read about Thomas Crapper, but to get his students standing in front of bookshelves in the library where hundreds of books that may attract their interests were. Mr. Hunter was not concerned about the history he was teaching at the moment so much as he was concerned about inspiring young men to have a curiosity about the history, the world they live in, and all sorts of other things. In today’s world, Mr. Hunter probably couldn’t exist. His humor would have be deemed “offensive” by many and “trigger” others. To us, that is truly sad. Mr. Hunter was a man who took it upon himself to not only teach his students a course or subject, but to inspire them for life. For that inspiration, we can never thank him enough. We only hope that everyone in their lives has a teacher that does the same thing.